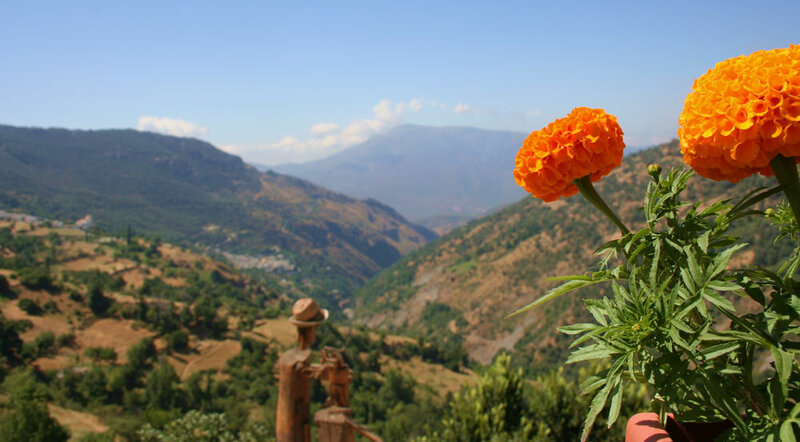 The Alpujarras is a spectacular landscape to explore as a tourist, trekker, or curious adventurer. Its mountainous terrain dotted with rustic whitewashed villages has a history than dates back to Roman times and continues to thrive as a popular getaway for not only visitors to the Granadian provice, but for locals as well looking to escape the hustle and bustle of city life. The region has always been an attractive site, starting with the Romans who mined the area for minerals and metals, but was really settled by the Berbers who cleverly terraced the land to maximize its farming capabilities. 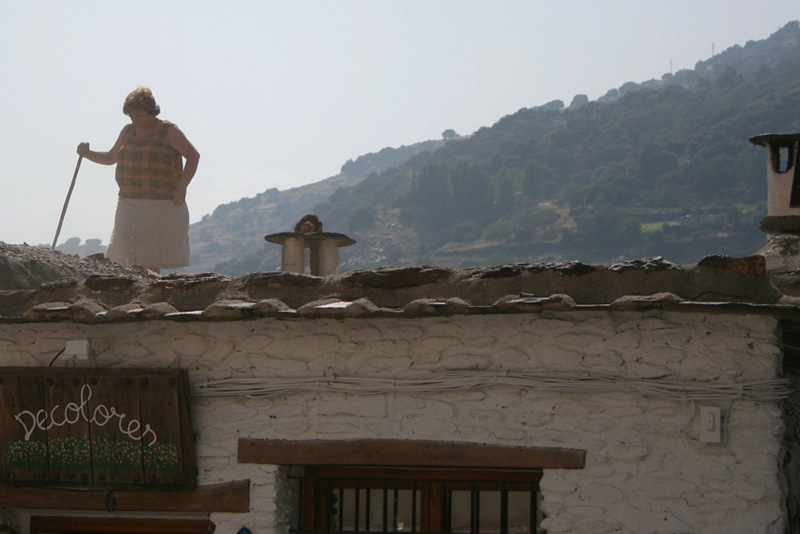 The villages of the Alpujarras have a very distinct architecture as a result of the Berber occupation: flat-roofed, box-shaed white houses with tall round chimneys, clustered along narrow, winding and steep streets, clinging to the mountains of the Sierra Nevada. You can see the same style of homes in the mountains of Morrocco. When the Moors of Granada were finally defeated by the Christians in 1492, many fled to the hills where they cohabitated with the Berbers and continued to preserve their Islamic culture and beliefs for more than a century following their expulsion from the city. After an unsuccessful yet bloody Morisco uprising, culminating in the public execution of the Moorish leader Aben Humeya in Granada´s main square, King Phillip II brought in over 12,000 families from Northern Spain to repopulate the area with Christians, however the architecture of the region remained untouched, just as it was prior to the 15th Century. Despite the limitless possibilities to explore the plethora of hidden townships among the Alpujarras, there are some can´t-miss spots to include in your itinerary. El Barranco Poqueira – The trio of villages that cling one on top of the other to this cliffside are perhaps the most picturesque of the entire region, where you can still see red peppers set out to dry on flat slate roofs. Start your visit at the top in Capileira and visit the Servicio de Interpretación de Altas Cumbres at the entrance to town from the highway, where they will fill you in on the various hikes you can take from the village to the others below. Before you start your trek, make sure to fill up on one of many delicious pastries and homemade bread baked daily. Just follow your nose as you stroll to the main plaza and you will see the panadería on your left. They are open every day, including Sunday. Most of the hikes from Capileira will lead you to the next village, Bubión, where you can enjoy the views of both Capileira and the village below from the church´s main square. If you´ve taken the longer hike, you´ll be ready to refuel, so stop off at El Teide just off the main road connecting the villages and order their plato alpujarreño (fried eggs and peppers, chorizo, morcilla, jamón Serrano and poor man´s potatoes) to enjoy an authentic delicacy of the region. Then take a stroll down the road to Hilacar, an authentic weaver (telar) who still uses the looms and original techniques brought by the Moors to elaborate traditional rugs and blankets. Continue your trek down to Pampaneira, the largest of the three, bustling with life and artisanal shops, and where you will also find the virtuous San Antonio fountain at the entrance to town. Apparently, if you are seeking marriage in the future but don´t yet have a prospect, drinking the water will grant you a spouse on the spot! 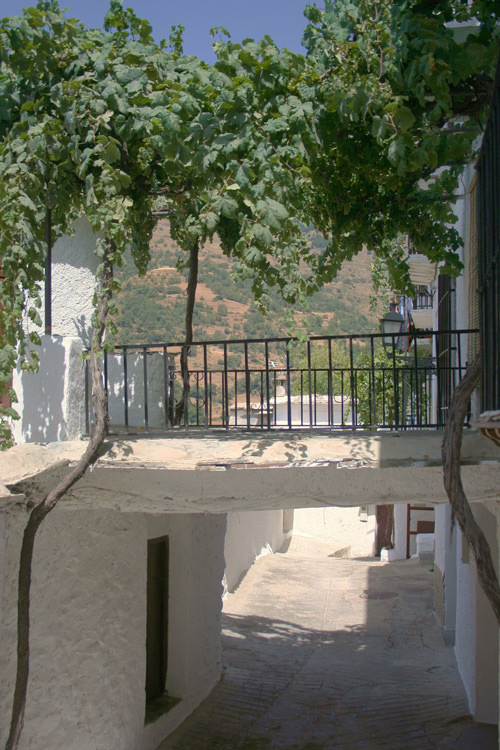 Lanjarón – This village is the official entrance to the Alpujarras, home of bottled water company of the same name and a medicinal health spa (balneario). Refill your water bottle in one of the various fountains scattered throughout town. It also boasts an enormous natural park, Parque Salado, where you can have a picnic then hike to the Moorish Castle. Lanjarón is predominately a rustic resort town, with many charming hotels restaurants to enjoy the Alpujarras in style. The Alcadima Hotel just off main street offers class, comfort, fantastic cuisine and the best views of the castle. Órgiva – The capital of the Alpujarras with over 6,000 residents, Órgiva offers a unique mix of people and activities. From yoga retreats to a historic replica of the church of Angustias (by the Corte Inglés in Granada), this municipality in the center of the region is a good base camp for any Alpujarran adventure. Fuente Agria – A hidden village just outside of Portugos, Fuente Agria offers the visitor a natural spring-fed river that is quite unique for its iron-tinged waters, said to cure all types of ailments from mineral deficiencies to sour stomachs. Take a drink then head to the open-air markets where a very ecletic mix of folk sell all types of goods, handicrafts, and products (varying in legality). Trevélez – With bragging rights of being the highest town on the Iberian Peninsula and the best jamón Serrano you have ever tasted, this mid-sized village is a mandatory stop along the trail. Climb to the top of the town to enjoy some of the most spectacular views the Alpujarras has to offer then have a bite in the Mesón la Fragua, said to be the best restaurant in the region. Be it for the views or the food, Trevélez is definitely worth the trek up the mountain. As the temperature begins to turn crisp and leaves begin to change, fall is a perfect time to visit the Alpujarras, offering a true cornucopia for the senses. 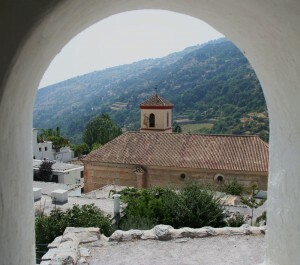 The Alpujarras is one of Granada´s best-kept secrets and your visit here will surely amaze and surprise. Moors and Christians Festivals (in Válor, Trevélez and Laroles) – A colorful and animated reenactment of the battles between the two, one of oldest and most famous in the country. In September, various dates. Fountain of Wine Festival (in Cádiar) – Celebrated to coincide with the Festival of Christ of Health, two spigots are installed in the main square from which wine flows freely for all to enjoy. October 5th to 10th. Chestnut Festival (in various villages) – Called the Tostón this fiesta coincides with the chestnut harvest. Think “Chestnuts roasting on an open fire….” Starting in October, but dates vary due to harvest. By car: With so many small villages to visit and explore, a car is your best bet. Take the A-44 highway south toward Motril. Look for the exit for Lanjarón. That will get you in the door, but it is best to purchase a map of the region beforehand. The roads are winding and narrow, so if you are prone to motion sickness, take a Dramamine (biodramamina) before setting out on your adventure. By bus: Bus tickets can be purchased directly at the bus station. Consult the Consorcio de Transportes Granada for routes and prices at http://www.ctagr.com/index.php.